16 ft. long, 6 ft. 6 in. beam, hull 3 ft. 3 in. deep, cabin 9 ft. long, weight about 5 cwt. A cabin day boat, but with bunks long enough to sleep on and space for a chemical toilet and portable cooker. Similar in general form to Woodwych, but more compact and easily handled on and off a trailer. 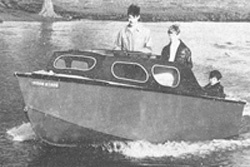 The bottom has a moderate V and the hull is built upside-down on frames. A 5 H.P. outboard motor is suitable for inland waters, but the boat will plane with upwards of 15 H.P.